Currently this engine has about 20 hours of run time. Smartplug 30 amp shorepower inlets (2). Pre wired and plumbed for a generator -- both water and fuel supply. Magnum MS2812 inverter-charger with remote control. Reverso oil change system with three extraction points (two in use). Side-Power bow and stern thrusters. All batteries are Northstar AGM. Four house bank batteries, one engine start battery, and one bow thruster battery. Heavy hand laid fiberglass hull construction. Vinylester resin is used in the outer layers to help prevent blisters. Integral grid structure is designed t provide a very sturdy hull with little flexing. All handrails are of double-rung design for added safety. They are welded and beautifully polished as is all of the deck hardware. The holding and fuel tanks are of FRP and the water tanks are of stainless steel. Close inspection will show construction detail, materials and equipment to be of superior quality. This vessel is under factory warrantee until September of 2019. Entry aboard is via large swim step with removable safety handrails (staples) through a transom door to the large aft cockpit. There are also port and starboard entry doors to the cockpit. The cockpit is large enough for deck chairs and small table. Also in the cockpit is a built-in cabinet with a 110 v electrical outlet for an electric barbecue with storage below. There is also a hidden shower and a swim ladder. Opening a large sliding door provides entry to a grand main saloon with the galley. Granite counter tops, teak and holly floors, teak paneling beautiful lighting, U shaped seating at a dining table and an entertainment center featuring a 48" TV with a custom sound system will provide hours of relaxation in the destination of your choice. You and your guests will have plenty of room in comfort and luxury. There is a day head to port forward and down a couple of steps. To starboard is first the custom entertainment cabinet. Forward to starboard is the L-shaped galley with 9 cubic foot stainless steel NovaKool refrigerator with separate freezer below, a Sharp Carousel microwave oven and a Force 10 three burner propane stove with oven. To the left of the companionway to the pilot house is a floor to ceiling custom teak storage cabinet. Up two steps to an outstanding pilothouse. L shaped seating with another dining table makes for another gathering place whether at the anchor or underway. It also converts to sleeping for one. Port and starboard are sliding doors to the side decks. To starboard is the lower helm with electrical panel aft and below the helm seat. To starboard and aft is a cabinet with a counter top. There is more than ample chart storage forward. The navigation and engine instruments are conveniently located to be seen while underway. The center window opens for adjustable ventilation by a custom electrical control. Forward and down to port is a guest cabin with sleeping for two and additional storage. Starboard is the master head with separate shower enclosure. Forward is the master cabin with a full queen-size double bed and custom foam mattress. There are storage cabinets along both sides of the bed. This owner had an extra 110 volt outlet installed to facilitate the installation of his 38" flat screen TV. Out the pilot house doors, port or starboard, are the side decks leading forward to the foredeck or to the dock for line handling. Aft up very wide easy steps to the fly bridge and upper helm. There is a starboard side helm with pedestal chair and U-shaped dinette seating with table. The propane storage is under the aft seat locker. There is storage under the dinette seats and under the forward counter of the helm station. The helm station features a polished stainless steel wheel, bow and stern thruster controls, engine gauges, electronic engine control, auto pilot and depth sounder. There is hinged radar mast and ample double railings of polished stainless steel. Canvas covers for protection of the bridge helm and the seating. 11 gallon hot water tank. Reverse-cycle heat/air (three units). The two heads use Dometic Masterflush with freshwater flush. Raw water wash down in foredeck locker. For all practical purposes this 2019 Helmsman Trawlers 43 Pilothouse is a brand new boat. The seller took delivery of this custom-ordered boat in September 2018. The only hours on the engine are the run time from off loading from the ship to the seller's dock (20 hours). There are several custom features which are described in the body of the specifications. To keep as new he has avoided using the facilities with the exception of the refrigerator and the TV. The seller has placed the ownership in an LLC which is available for purchase with the vessel, which can have a real advantage in the sales tax consideration. 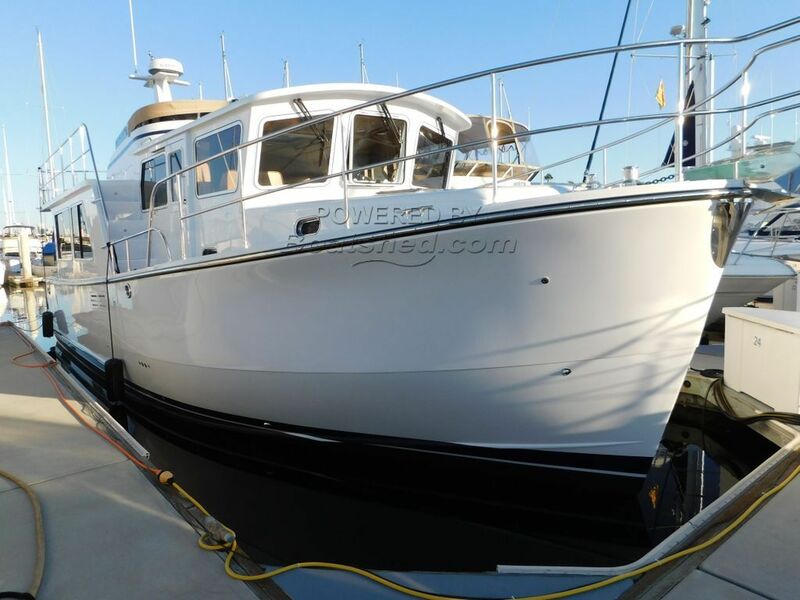 This boat is pristine, and offers an amazing amount of living space for a 43' boat. Quality construction is evident throughout. This is an outstanding opportunity to own a new Helmsman 43 without paying the current new boat price. And there is no need to wait six months or more for a new build! This Helmsman Trawlers 43 Pilothouse has been personally photographed and viewed by Dave Carleson of Boatshed Seattle. Click here for contact details.